January 29, 2015 : Interview with Speedsolving.com member Collin Burns : Currently (at the time of this interview) holds the North American record for 3x3 Single (5.93 seconds), is ranked 12th in the world for 3x3 Average (8.06 seconds), and is ranked 7th in the world for 3x3 One-Handed average (13.22 seconds). He is the current 3x3 US Nationals champion (2014) after winning with an average of 8.32 seconds during the finals. Probably 3x3. As the main event it's just what I've always practiced the most. It doesn't take much time like some big cubes, but it's also not as dependent upon luck as, for example, 2x2. While I really only practice 3x3 and OH at the moment, I am interested in trying other events, especially BLD and FMC. 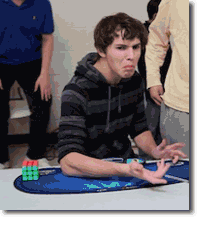 Several years ago I found out my friend's brother could solve a Rubik's Cube in a couple of minutes. I was really impressed, so later I looked it up on youtube and learned how to solve it myself. I didn't know anything about speedcubing and stopped for a year or two after that. A little over four years ago I somehow picked it back up and this time learned about the cubing community. That's when I started trying to become faster, and I've been improving ever since. Either getting NAR single or winning Nationals. The single was quite lucky with a 7 move last layer, but it could've been a lot better without the lockups during LL. I'm nonetheless quite happy about it. As for nationals, going in I was just hoping to podium, and even that I wasn't really expecting, so it came as a huge shock when I won the whole thing. I still feel like I didn't deserve to win though. But I suppose in that sort of situation it's all about who can best handle the pressure. I did well and just about everyone else in finals didn't. Several other people could've just as easily won. Still, winning was an absolutely incredible experience and not one I'll forget. People talking during movies. Once is okay, but repeatedly is incredibly annoying. I expect it will continue to grow and records will continue to be broken and it will receive more and more media attention, all of which I think are good things. The 3-day competitions I've been to, Worlds 2013 and Nationals 2014, have by far been the most fun, even though I didn't compete well for the most part (other than 3x3 finals at nationals). Getting together with so many friends whom I hadn't seen in a while and making so many new ones made those weekends some of the best and most memorable of my life.